Chocolate brand Kinder Bueno is attempting to attract new consumers with a 'Try Me Free' television campaign. Ferrero-owned Kinder Bueno will include 5.5 million products in the promotion to help drive consumer awareness and demand. Television spots made by Krow will end with creative pushing the 'Try Me Free' promotional offer, which was created by B Street. Consumers can try the product "free" by buying it in-store and later receiving a cash refund after sending off the promotional wrapper and till receipt via freepost. Customers can also redeem the promotion via a dedicated microsite or the brand's Facebook page. 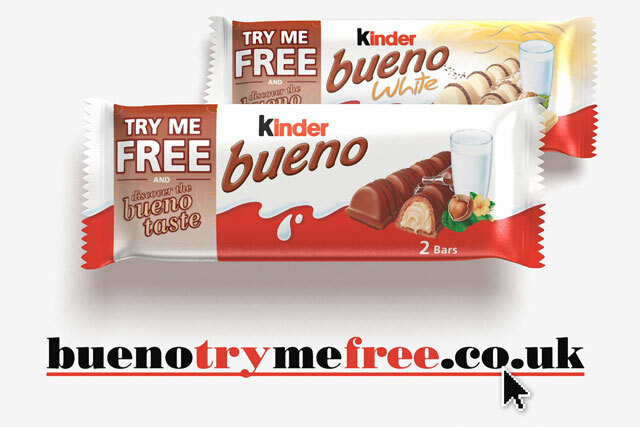 Kinder Bueno got around stringent advertising regulations around "try me free" television advertising by taking out sufficient insurance for over-redemption, to prove the promotion was free for all consumers. The promotion is also designed to drive consumer data collection and increase the brand's Facebook fans. A further promotion running online will offer the chance to win Champagne balloon flights across the UK countryside.